Hawaii Miracle Child Celebrates Mother’s Day at White House Black Market – Chico's FAS, Inc.
Julie was diagnosed with an enlarged heart the day before Thanksgiving in 2013 at Kapi’olani Medical Center for Women & Children. Then 11, Julie was admitted to the pediatric intensive care unit with her heart functioning at only 10 percent. Julie’s doctors determined the need for a heart transplant and prepared Kapiolani’s specialized transport team to safely transport Julie to a mainland center. Donations to Children’s Miracle Network Hospital, such as those that come from the purchase of White House Black Market’s Miracles Charm Bracelet, helped fund Kapi‘olani’s pediatric transport team which ensured that Julie was safely transferred from Kapi‘olani for her transplant surgery. The transport team, funded in part by CMN Hospitals, is critical for ensuring that Hawaii’s children receive the medical care they need. Today, Julie is a mature, composed and cheerful teen who’s proud of her scar, as it’s a reminder of all she has been through. This Mother’s Day, consider the White House Black Market Miracle Charm Bracelet as a gift to your favorite mom. $15 of the purchase will go to help pediatric patients just like Julie at your local CMN Hospital. And join us on social media to share your Miracle Mom story by using the #MiracleMom hashtag. 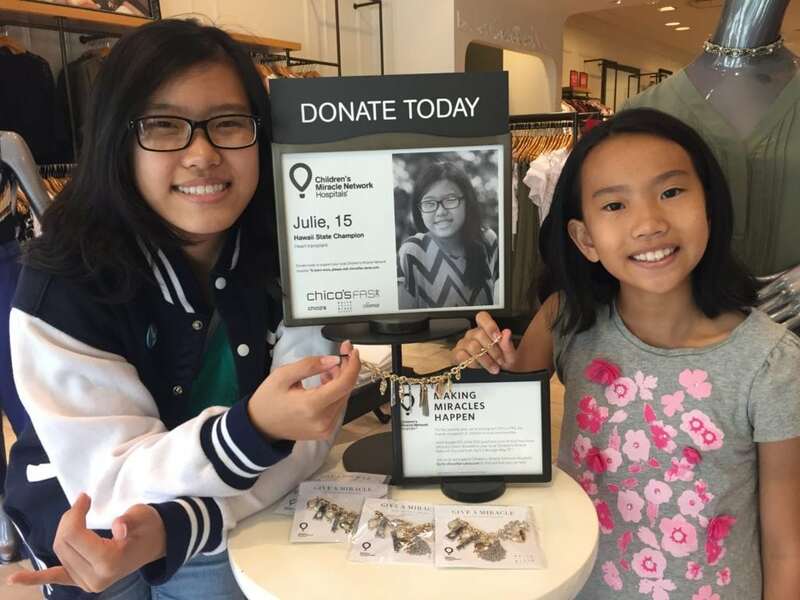 Through May 31, Chico’s FAS, Inc. and its family of brands – Chico’s, White House Black Market and Soma will continue to raise money for Children’s Miracle Network Hospitals during their 2017 Miracles Campaign. Since 2011, Chico’s FAS, Inc. has raised more than $8 million for Children’s Miracle Network Hospitals. Learn more about how Chico’s FAS, Inc. is supporting CMN Hospitals by visiting chicosfas-cares.com.